This has been the philosophy behind the working of the Adventure Club. 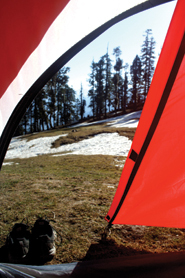 The Adventure Club prepares boys to undertake the mid-term expeditions for the entire school twice a year in the months of April and October, when all boys and masters go on a compulsory five-day trek to the Garhwali, Kumauni and Himachal hills. Boys from D to A form go with their respective tutors, and senior boys plan their own treks in small groups of four to eight. The concept of mid-term breaks is at the heart of The Doon School experience and helps to build qualities such as leadership, responsible behaviour, and care for the environment and respect for the local culture. The Club also organizes mountaineering expeditions at least once a year for the senior boys. The Doon school has a great tradition of mountaineering, pioneering the sport in India. School produced decorated mountaineers such as J. A. K. Martyn, Holdsworth, Gurdayal Singh, Nandu Jayal, Harry Dang and many more. School boys and masters climbed Kedar Dome, Bhagirathi II, Jogin III, Thelu, Kali Dhang, Jonli, Black Peak, Stok Kangri, among others in India, and Mont Blanc, Gram Paradisu, Kilimanjaro and Imja Tse abroad over the last couple of decades under the leadership of the school mountaineering in-charge. Recent trips have included the trek to Everest Base Camp and also to the Thar Desert.